Rifton large supine stander promote upright social interactions at the same eye-level as a client's peers. 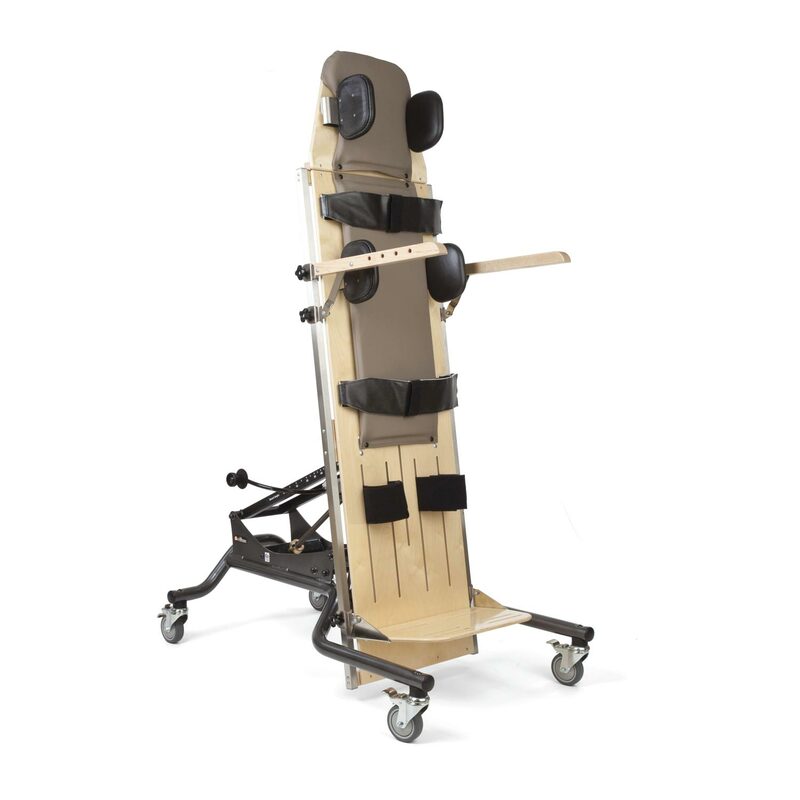 Supine stander enables vertical standing for adults and children with special needs. Using a vertical stander can strengthen core muscles and improve weight-bearing, weight-shifting and trunk control. Adjustable supports on the standing aid allow for functional alignment, with the client's arms free for activities. Positioning someone with special needs in a standing position is the first step to facilitating bone and muscle development and maintaining range of motion in addition to encouraging better functioning of the body’s internal systems. Supine standing provides many therapeutic benefits, including head support with partial weight-bearing. Footboard - The footboard adjusts, bringing the client up to a comfortable height for the caregiver. Fold-down top - Fold down the top of the supine stander for a user who needs to learn head control. Angle adjustment - Small Supine Stander: Angle adjustment is calibrated from 0° to 85° for accurate positioning. Lateral supports - The lateral supports slide out of the way to aid transfers. Lateral supports adjust easily: they slide in, out, up, down, or rotate. Armrests - The armrests move up and down the frame or tilt at varying angles to encourage upper body control. They fold down when not needed. S-curve frame - The sturdy, curved frame gives plenty of foot room to the caregiver, and allows close proximity for transfer in and out of a wheelchair, or other equipment. Height adjustment - Large supine stander: The manual crank handle lowers the stander horizontally to 21" (wheelchair height) for a sitting transfer. Raise the large supine stander up to 30" to accommodate other transfers. Why use a Supine Stander? For improving head control: The head support on the stander can be flipped down to allow the user opportunities to initiate and maintain head control. Upright interaction: With the ability to reach 85° of upright positioning, users can be at eye-level with their peers, participating in activities and initiating communication. Easier transfers: The large Supine Stander provides horizontal adjustments of the mainboard from 21" to 30", making transfers to the stander easier from a wheelchair or bed. Standing option for medically involved patients: The firm mainboard of the Supine Stander allows users with significant musculoskeletal weakness secondary to prolonged immobilization the opportunity to be positioned upright. Stability is provided posteriorly making it a comfortable option for users with tracheotomy. For gradual progression to an upright position: The angle-adjustable stander is effective for assisting individuals to a standing position who have been bedridden for a long time. Ranging from horizontal to upright standing, it is a preferred stander for people with orthostatic hypotension to lessen the adverse haemodynamic response from a rapid change in position. Base Length and Width 46½" x 29½"
-- Please Select --Large supine board 71"